Welcome to Jellyneo's Guide to Neopia! Neopia is a huge place, and with so many places to go and things to see, it could get rather confusing. However, Jellyneo is here to help you with a massive tour of almost everything on the planet! You can navigate the maps by clicking on particular areas, just like you can do on Neopets; but with our version, you will also find plenty of guides and background information! For example, if you were to click on Krawk Island and then on Buried Treasure, you would find our Buried Treasure article. 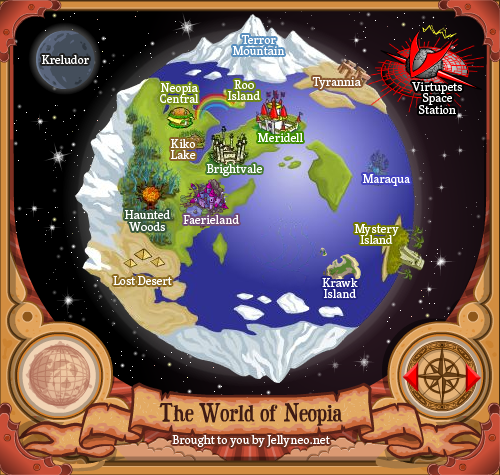 Take a tour of Neopia!